Sound Awakener is Nhung Nguyen from Hanoi, Vietnam. Ms. Nguyen has been studying classical piano for some time, but more recently has focused on developing her own compositional techniques. This effort is a 28-minute EP released in a series of recordings on her Bandcamp page. Ms. Nguyen’s background in piano is not apparent at all in hidden, as the album falls squarely into an electroacoustic vein, reminiscent what one would expect from a Groupe de Recherches Musicales (GRM) member, with a hint of dark ambient. She blends unnatural scrapes and rustlings, clicks, alien soundscapes, and moving walls of noise into a dense, structured dystopia. The first track, around, evokes a post-industrial wasteland, with motorized drones and rolling waves of mechanical distortion. The title track follows, featuring a more subtle, layered approach, with multiple “voices” combining processed instrument noises with generated sounds. The 11-minute diary is the final track, and contains a sharp complexity, wandering percussion, and a more acoustic feel. 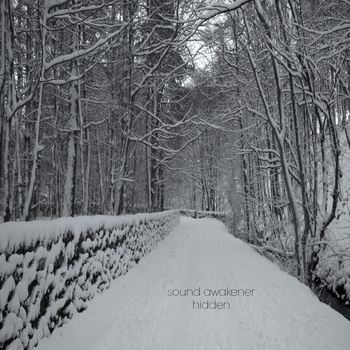 hidden is a notable early-career effort in musique concrete – structurally tight and quite engaging. Since the release of this EP, Ms. Nguyen has made several other recordings available, each of which I am looking forward to hearing. From 5049 Records, the final podcast. Jeremiah Cymerman has done a great job over the last couple of years with this podcast. Kudos. After two years and eighty-five episodes of conversations with some of the world’s most remarkable musicians, today I post the final episode of the 5049 Podcast. Of all the work that I’ve done in the past thirteen years of activity in NYC, the series of conversations documented in this podcast stand as one of my proudest achievements. Whether it’s been old friends or complete strangers, welcoming people into my home these past two years, pouring out a few drinks and getting into it has been an utter delight and an incredible growing experience that I will always cherish. For our final episode, I sat down with Nate Wooley and Toby Driver, the very first two guests of the show, and attempt to make sense of what these past two years have meant. Nate and Toby are my main guys and I’m happy to close things out with such men of distinction. Edgar Froese, the leader of the long-running and prolific German group Tangerine Dream — first an improvising avant-garde rock band, then an ambient electronic-music project, and finally an arena-filling machine of smooth and heroic synthesizer pulsations — died on Jan. 20 in Vienna. He was 70. Workshop Ensemble (WE) celebrate the release of SILT – a 16 minute sonic meditation which has been embraced by Bunny Blasto Records. SILT will be available as a limited edition 5.5 x 7.25 print by artist Ollie Glatzer, a visual meditation serving as the physical vehicle of the sonic work, in tandem with a private download of the music itself. SILT will be available for purchase in person at live events, or online via Bunny Blasto Records. Saxophonist Ivan Arteaga presents two new compositions for saxophone quartet (Neil Welch, Greg Sinibaldi, and Levi Gillis) with three contrabasses (Carmen Rothwell, Abbey Blackwell, John Teske) and voice (Katie Jacobson); an arrangement of a string quartet by Alban Berg; and arrangements of American folk songs by Arteaga, Levi Gillis, and Luciano Berio.